Sennheisers HD25 heaphones are nothing shot of legendary and have been worn by DJ’s all around the world. The were know as a robust set of good sounding headphones that could take a beating and just keep going. A few years back Sennheiser updated the range and now we have a set of Sennheiser HD25-1 ii in for review and the good news is that they are still to this day and excellent option if you want a ruggeed and well built set of headphones that wont break the bank. Build quality is excellent on the HD25-1 ii. These headphones are designed to be a workhorse earphone for mainly for DJing and monitoring purposes and in such scenarios headphones get a lot more use time than a standard consumer headphone. The line has been legendary in the past and I know many people who still own an original set over 20 years after purchase. This updated version has a number of refinments. the headband is extremely solid with smooth articulation poinst and adapatable sizing. Its so strong that i allows you to horribly contort them and they simply spring back into place so no issues in thowing them in a bag without a case. The earcups are high density plastincs that are both sound deadening and hard wearing. they have a textured finish which doesnt show up scrathes or other wear as easily as a painted headphone might. Headband padding and earcups are both made from the hard wearing Sennheiser faux leather that we have come to love and the good news is that both of these parts are easily replaceable over time. The styling of the headphones is very understated in the modern age. Its a good looking headphone but is certainly not a designer headphone. It follows an ethos of form over function and to many this may seem a little borine. However its unlikely that anyone with an interest in headphones, music production or DJing wont already know about why the HD-25 headphones are so iconic so if you are in the right circles you might find yourself getting the knowing nod of approval. The HD-25 headphones have never been considered a comfortable headphone for extended listening sessions. The are fine up to the 3-4 hour mark but you would want to take a break for 15 minutes or so before continuing. The main reason for this is also what makes them so good at isolating you from your external environment. That is the clamping force. The Sennheiser have a very strong clamping force that binds them tightly to your head and that combined with the on ear earpads can cause pressure build up. The good thing is that afore mentioned drawback is also a blessing when it comes to isolating you from your environment. The HD-25 ii fall only short of dedicated noise cancelling headphones in terms of reducing unwanted sound from your listening. The combination of solid seal against the head and the sound deadening earcups make these near perfect for use in loud environments. 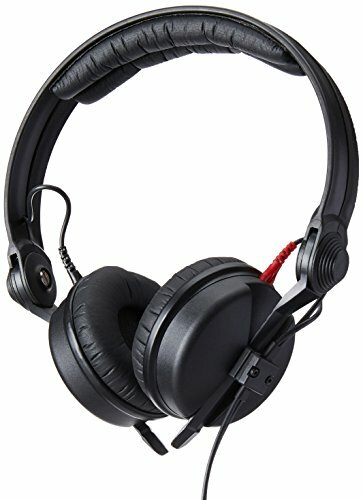 The sound quality of these headphones is well known amongst musicians and audiophiles alike and is almost always praised its a very detailed and accurate sound with a balanced response. Speed of attack is excellent and they have a punchy high energy quality to them. However due to the 70 ohm resistance these headphones have you will want to make sure you are using them with a suitably powered source. They are balanced and flat in response meaning that the do not add any artificial flavor to your sound it is accurate and pure. If you are used to consumer headphones with enhanced bass response and warmth across the midrange then these will be quite jarring and almost lifeless sounding to you at first but it gives a far more accurate reproduction of the sound than many of the headphone you are currently able to buy. Soundstage is nothing special its a very distinctive in head experience with equal placement of width and depth. Detail retrieval is good right across the spectrum and there is no shortfall in the treble yet still no sibilance despite being somewhat bright. Imaging is also very good and it is very easy to distinguish and position instrumentation in complex tracks. In terms of pairing genres I think these headphones sound best when paired with rock, metal and acoustic but for bassier genres you would struggle with the subdued bass quantity. Its worth noting that the Senheiser HD-25 have been around for 30 years and part of the reason the are still so popular is the wide availability of replacement parts. Almost everything on this headphone is replaceable meaning that they are one of the true headphones that stand a chance of lasting you for the rest of your life. The Sennheiser HD-25ii are and iconic headphone and with over 3 decades from the headphones release the fact that they are still so popular in music production speaks volume to their quality. If you are looking for top notch build quality, excellent longevity and a balanced accurate sound then these are still a very good headphone for the money.